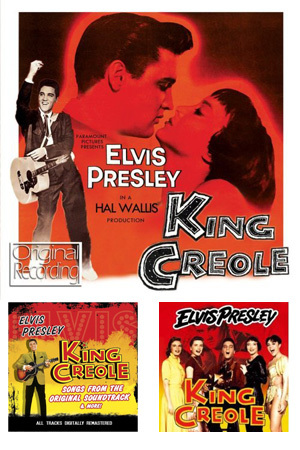 This is the third cover for the "King Creole" soundtrack re-issue. The Hallmark (H'ART) budget label will re-issue this soundtrack on May 18, 2009. Dixieland . I say : the makers are not the same as lost stereo .DEifferent record labeland differnt guys. RCA recorded Elvis in Binaural since 1956 (love me tender) .But only as back -up tapes they say. But He'll have to go of jim reeves And the lp Songs to warm the heart are also im Binaural stereo. And released Also his 1959 gospel album .God be with you . And in that same year most of the record company's relased and recorded in stereo. But i read somwhere and a while ago that RCA recorded Elvis is binauaral stereo until 1959. But Rejected by himself and released all in mono.But on these cd's you'll find the mono versions,beacuse it comes from(almost) one acetate. But altered with some speed difference. japio, are you saying there are stereo tapes from the King Creole sessions that survived? Just curious. I hope there are stereo recordings from this session. I've never heard of any. No it's not from the Lost stereo tapes. I know these guys and it's mastered in a real studio. And done in the same way like Treat me nice from the great performance. But that's the problem here nothing is good,it's always compaining. But 3 different cvers is too much. Are these the same people that released the so called KCreole Outtakes and Lost stero takes ? Then it must be fabricated remixing in someone's garage tape deck right ?